My name is Edina Berecz, we live in North-Eastern part of Hungary. Our briards live with us like our family members. We have a lot of activities together, just as going to dog shows and make sports with the dogs, or just have a nice walk together in the nearby forests. 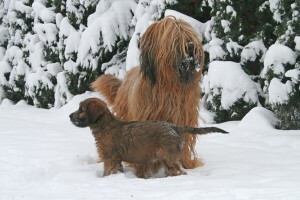 I have start my “briard-life” in 2000, when i have brought home my first briard-girl, named “BORKA” – Playful Paw Diana. When i have choosen this kind of dog breed, it was mostly by accident – i liked the exterieur very much, and according to the articles i read i have found this kind of dog very symphatic. After 16 years with briards i know it was a desire to choose this breed. BORKA was my first dog to teach, and to live close each other. She was very sensitive and very brave at the same time, with loving and sweet character. 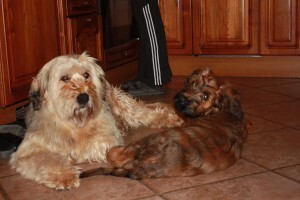 After i have had her, i knew that my love with the briards is based very deep, not only on the exterior. In 2008 i was searching for another dog, with the main goal to start on and to be succesful on shows. I was searching and looking for a suitable puppy for a long time, and now i know: he has choosen me! He is ALTESSE Les CHIENS DE MARKI and his callname became BALDO. He has come from Zsolt Márki, from the “Les chiens de Márki” kennel, Budapest. His father A’romero des Plaines de Brotonne (Frenky) has come from the famous French kennel as the son of Picon Biére and his mother Angie from Czech from “Z Andaye” kennel with also excellent relatives. Baldo had great ancients in his pedigree but beside it i have to admit i had a great luck with him. With him we could reach everything and even more then i expected….We learned together step by step how to present on shows, we have travelled a lot and have get known a lot of briard-friend people, and we have made some really deep friendship among briard-owners. He has won a lot of winnership accross Europe that we even couldn’t expect before, and as i think back i am still very grateful and feel blessed that we could experience it. We reached it together, and even i think that he could have been more succesful with a profi handler then me, actually we worked together for everything…………and it means a huge value for us that has strenghten our friendship more then anything. 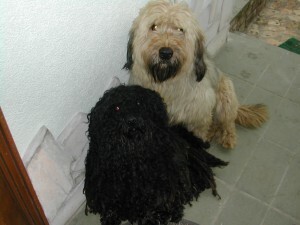 Baldo was the first Hungarian briard, who has reached the home country’s biggest acknowledgement, the French Champion title. He has won on many clubshows and specialities, and of course on “normal” national and international exhibitions too. Beside it he has prooved his working and mental abilites according to his succesful IPO-1 exam. My third briard is called MIRA, she is the daughter of Baldo, and she was born in the famous Czech kennel in 2010. HAPPY GO LUCKY MORAVIA CAMPANELLA, aka Mira has brought something very new in our family: she became our little happy and funny girl who has always made something trouble, but was so sweet we couldn’t got really angry of her. She is very active and easy-going at the same time, she is friendly and open-minded dog. Beside the show-life we have improved our sporting side too, but after all the experiences we have lived together for now my most important goal has became to feel ourself well with the dogs and live more and more adventure together.